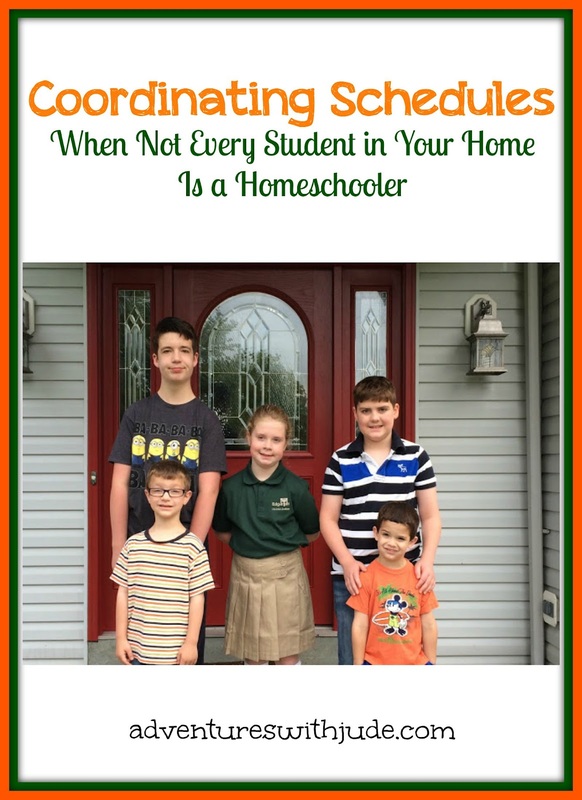 Most families have children all doing the same type of school -- either they're "homeschoolers" or they're "in-schoolers." Our family is a mix of the two. When we first started homeschooling, Jude was at home and the big kids still in school. Luke and Matthew have since become homeschoolers, and Damien is remaining at home, but Celia has chosen to remain in her school. This is a good decision for her - the teachers fit her style of learning, and she enjoys the extra-curricular activities. However, it does make things interesting when we plan our calendar. Officially, the boys' year runs concurrently with hers. Although the boys started back to work at the beginning of August, her first day of school in September is the "official" start of the year. Although the boys will move on to the next level of work whenever they're ready, they don't officially "move up to the next grade" on her last day. Celia was done for the day at 11:15 but Luke's Spanish lesson wasn't until just past 5:00. The feeling behind this picture after Spanish class was "Whoo, FINALLY!" We tend to plan our big breaks around her big ones, just so we don't "waste" her days off being tied down with schoolwork. This year, we'll probably end our actual "instruction" on the Friday before Christmas, so the last two days she's in school the following week are open to tie up loose ends. It's hard to convince the boys they need a full school day on the 22nd when they know her day is going to be basically a Nativity Bible service, a Christmas party and be over by 11:15. However, we don't take off every time she has off. 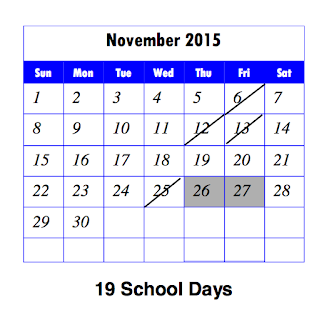 She'll have several half days in November, but the boys will have full schedules on that day. Celia has also benefited academically from the boys' programs. Clearly, we have a lot more "school stuff" laying around, which is good because she has an insatiable appetite for learning.. I frequently find novels and biographies missing from my curriculum book stack, and when I ask "Has anybody seen...?" the reply is "I've got it! Do I have to give it back yet?" She also participates when we review products. I'm careful to not overload her, since she already has a full day plus homework, but she's honed her math skills (after working with one program, her grades went up a full letter and landed her on the honor roll), found some new favorite books, and even surprised her teacher when a Bible program review over the summer made her one of a very few students who could name all twelve sons who became the Tribes of Israel. She's also enjoyed field trip learning. We have held off on our big trips until summer, so she can come. (Our trip to Antietam is part of why Luke's book on Clara Barton kept reappearing from her night table, with a book mark not at the page he left it on.) When we plan trips, we will often dovetail them with the boys' lessons, but we also try to pick things she has been learning about. She is a proud Junior Ranger - when we plan to go a NPS Site, her first question is "Do they have a Junior Ranger program?" 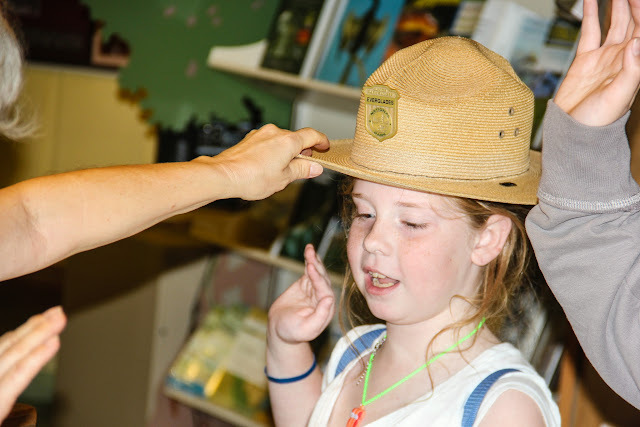 She has Ranger badges from ten different sites, and even got to wear a Ranger's hat for her "swearing in" at Everglades National Park. 7:30 - Luke gets up, and gets himself organized so he can watch the little boys while I run her to school just before 8:00. Since he can stay with them, I don't have to do coats and shoes for a ten minute car ride. 8:15 - Luke and I usually go over his work while I tank up on caffeine over a cup of coffee. He's learned that I'm usually game for scheduling and "Can you clarify what you want me to do with this assignment" questions right away, but any deep academic discussions need to wait until I'm at least on my second cup. Sometimes I get my first cup before I take Celia, but Luke has learned that if he doesn't see an empty cup when I leave, he better not ask me anything too detailed. Matthew usually gets up somewhere in here. 9:00 - Homeschool starts. The big boys start on their assignments, and Jude starts his. Damien used to just fit in wherever, because Jude really needed one-on-one instruction all the time because he wasn't able to read. This year, I'm hoping to adjust him to being able to do at least a few worksheets independently so he and Damien can work simultaneously. Our afternoons are a little helter-skelter, because the biggest issue is what time to pick Celia up. Of course, she doesn't have two days in a row with the same pick up time, so the challenge is remembering what day it is. Thank goodness I can set alarms in my phone! I have an alarm set for every day at 2:15 -- that's my warning that we need to either finish what we're doing, or get to a "pause" point. We often get lost in what we're doing and lose track of time. If Celia has a half day, I set alarms for 10:30 (to tie things up to a break) and 11:15 (to pick her up). I honestly think the hardest part of our day is late afternoon! Last year, I let the big boys do their work in any order, provided it was all done by the end of the day. It usually ended up with them and Celia needing help at the same time. We began purposely setting the Luke's Spanish lessons for late afternoon and early evening. He prefers to have them towards the end of his day, and it guarantees me one hour when I'll only have two kids to run between. We'll keep that part of the routine when she starts again, but I think we may have to revisit some of their video-based programs, and schedule them so that who needs me "that minute" can rotate, rather than everyone being ready for help simultaneously. Having students both at home and in school isn't as difficult as I thought it would be. Scheduling actually a little more streamlined, because we only have one school calendar to work around. The two styles work together well to provide us enough structure at home to work well, and not so much rigidity that we feel like we are beholden to a clock. For our family, it's the best of both worlds. Each of the boys gets an individualized program that he can thrive in, while Celia gets a program that suits her needs well. A hybrid plan is what works for our family! Click the image to see a list of all 55 bloggers participating in the Hop. See how they plan for the Back-to-Homeschool season.